Veganism has become significantly more accessible around the world in the past few years. As I prepared for my trip to Palestine, I didn’t have any concern that I’d have to suffer or make concessions from my values. It was quite the contrary: I view plant-based foods as closer to the roots of indigenous cultures around the world, including in the Levant, rather than as a new Western diet fad. In this way, I strongly believe that the transformation of food culture is an important facet of colonialism, especially in Palestine. A noteworthy portion of Palestinian food is plant-based. Besides desserts that use eggs and milk, most dishes are vegan. Meat isn’t necessarily the centerpiece of the dish, and cheese is typically used as a topping. Even before I became vegan, both were often omitted in my household. Snacking is an important part of our culture, so meals are always surrounded by nuts or fruit, and followed by Arabic coffee. Every Palestinian household or restaurant has vegan options by default, unlike their counterparts in Western countries. The default breakfast isn’t bacon, eggs, and sausage like it is in the US, and salad isn’t the only thing on the menu that we can eat (and only after asking to hold the cheese and dressing). I had no trouble trusting that almost all the non-meat foods offered in Palestine contain no animal products. Falafel places are automatically 100% vegan because nothing else is fried with the falafel balls except for potatoes. All the toppings are raw veggies tossed in oil and spices, if anything at all. Shawarma is always separated, and unlike here in the US, I didn’t see any tzatziki or yogurt on the side. Hummus (الحمص) and zaatar (زعتر) made up most of my breakfasts. We eat almost everything with bread, which traditionally is not prepared with any eggs or dairy. I had hoped to eat more fruit as it’s incredibly cheap and fresh there, but our love for bread kept me stuffed all day, every day. Bread bakeries (مخبز) are vital to our food systems–in 8 days there were half a dozen trips to pick up some sort of bread product or zaatar/onion/cheese pies. The only issue besides the love for لبن‎ (Arabic white cheese) was the smothering of everything with olive oil—if you can call that an issue at all! I also ate a lot of stuffed grape leaves (ورق عنب), squash (قرع), fava beans ( فول), eggplant (باذنجان), cauliflower (قرنبيط), okra (بامية), etc. A little-known fact is that religious Arab Christians go totally plant-based for the full 40 days of Lent. This made it much easier to find food as we could ask for طعام صائم or “fasting food”. Pastries were more difficult, but we were able to find quite a few things that were free of animal products by asking for fasting foods. 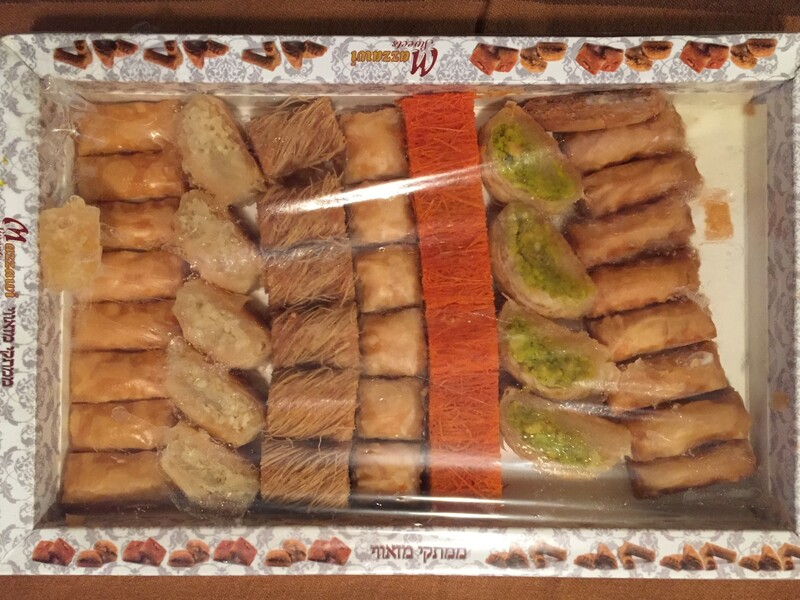 We even discovered that my uncle’s sweets shop avoided animal products, and I brought home a whole package of vegan baklava. I had made a point to avoid Israeli/white-owned restaurants (more on why later) and I didn’t feel that I missed out much. The result was a week full of almost fully whole-food-plant-based eating. 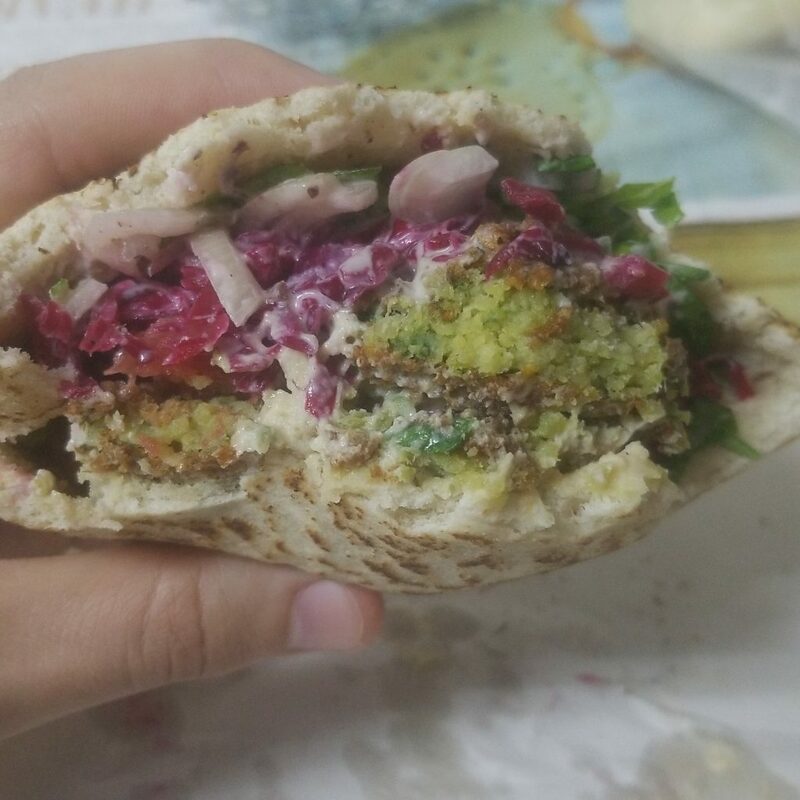 I will admit that I had wanted to try vegan shawarma, and did cave one day at a huge new theater I went to in Haifa. It wasn’t anything special—it tasted like Gardein and was garnished with some veggies on a focaccia bread. And it was about $15 USD, compared to $3-5 for traditional Palestinian street food, like shawarma made with meat as well as falafel, hummus, or zaatar pies. I didn’t really expect much from one of many heavily gentrified areas. Palestine and Israel: What’s Going on Here? Now a quick note—when I say Palestine, I’m talking about what the West calls Israel [colonized Palestine] and not just the occupied territories in the West Bank and Gaza Strip. My relatives are part of what we call “’48 Palestinians“. This means they live in the state of Israel legally as second-class citizens. Around 1/5th to 1/4th of Israel is still made of Arabs who were not forced out in Al Nakba or returned and were forced to become Israeli citizens. This is an incredibly troubling place to be on a physical and psychological level; since 1948, the state of Israel has tried to pit Arabs against each other by religion (Muslim, Christian, Druze) and they have been fairly successful in doing so. As this continues, Zionists are not only moving into historically Arab areas in northern Israel, they are also building settlements in occupied Palestine. I see this flavor of colonialism as similar to the oppression of people of color in the US, since we’ve now adapted outright invasion and slaughter to mechanisms like gentrification in Haifa and other Arab cities. The economies of Israel and the US are very similar in their concentration on large technology and military industries which, unsurprisingly, are shared between the 2 countries extensively. It’s become well-known that the US provides an enormous amount of aid to Israel every year. Capitalism demands that for those who have, others must have-not, and war is too profitable of a business for Israel to give up. I mention these points because Israel is considered by many to be the most “advanced” or “democratic” country in the Middle East, and it has constructed this image through similar processes as the US has—colonization. It’s not just war. Much of Israel is built and maintained by Arabs, and the privileges that Israelis enjoy don’t just come at the cost of Arab lives, but of the limited time and energy of Arab workers in their own homeland. This video discusses the racial wealth gap in the US, and I found it easy to draw parallels to the racial divide within Israel/Palestine. So, Palestinians are oppressed in Israel…how does this relate to animals? As we look at statistics, Israel has similar meat consumption to western/imperialist countries. Yet many vegans consider Israel a vegan paradise, and earlier I presented a long list of plant-based foods that I ate in just one week. This is because colonizers are the ones who impose mass-scale animal agriculture. Western foods like hot dogs and hamburgers were never a thing until recently (and therefore neither were the vegan versions of them). The most troubling thing about this to me is that while most of my relatives acknowledged that half a century ago (before the Israeli state was well established) they rarely ate meat, they still viewed my veganism as something أجنبى (foreign). The idea of eating plant-based foods had been erased (by Israel) from their short-term memory. They were constantly worried about feeding me, not realizing that I had significantly more options there than in the US, with exception to fully vegan restaurants. Ironically, these are concentrated in the white communities of both the US and Israel, despite efforts (at least in the US) to decolonize and raise up people of color. It’s a painfully ironic reality that the communities who benefit most from human and animal commodification also host the most vegan food spots. To me this is indicative that the only language the West speaks is capitalism. Unfortunately, in this way, plant-based food is appropriated and transformed into something niche instead of something accessible to the communities that need it most, similarly to what the West does with yoga, meditation, eastern medicine, etc. I simply cannot discuss animal rights/plant-based eating in a non-“Western” culture without drawing attention to the difficulties these peoples face in terms of simply staying alive. That being said, I attribute the main driving force of animal commodification to white supremacy and capitalism in their utilization of imperialism and colonialism. This is an imperative distinction to make when discussing Palestine as it is the contemporary textbook example of settler-colonialism and military occupation. The small family bakery or shop is imperative to our culture in Palestine, and the influx of fast food and grocery stores are a massive threat to that. What we noticed, and what was outright told to us, was how the culture had shifted from the days of perusing multiple shops or markets in the town to driving everywhere and making one stop at the supermarket to get everything for the week. Traffic was worse than ever before, half of the famous market in Nazareth was closed, and fast food and supermarkets lined the main streets and highways rather than family businesses. This is economic warfare, and it is seriously the biggest affront to our way of life. Just like in the US, we flock to the convenience because we’re too tired and unable to look past the next day or the next meal. And with each of these compromises the systems of oppression strengthen. This is why decolonization is so imperative to my worldview. If we truly desire to free ourselves and non-human animals, we need to re-prioritize mutual aid and divest from faceless, mechanical economic systems. In Palestine, there’s a lot to go before animals can be a focus, and there will be no chance of it at all until foreigners and colonizers acknowledge the role of colonialism in their struggle. In the U.S., POC are rising and taking the helm of the animal rights movement, and it’s only a matter of time before Palestinians do the same. It’s imperative to support Palestinians, support animals, and embrace decolonization as a central piece of your activism. Yousef Shami was born and raised in the tumultuous political climate of Washington DC. Gaining interest in politics through high school, Yousef began getting involved with various social justice groups and eventually radical leftism, which later led him to veganism. He now co-organizes Collectively Free’s DC chapter with his partner. Yousef is a musician and video game enthusiast who lives with his loving partner and their 2 bunny companions in the DC suburbs.